Sunday July 21st 1878 I helped do up the work this morning and dressed for church. When I got home they had dinner nearly ready. Hatt and I spent nearly all the afternoon down to Robinsons and the girls came all the way home with us. The supper was late tonight. i wrote a long letter to M.B. Bailey in the evening. Weather very much cooler. 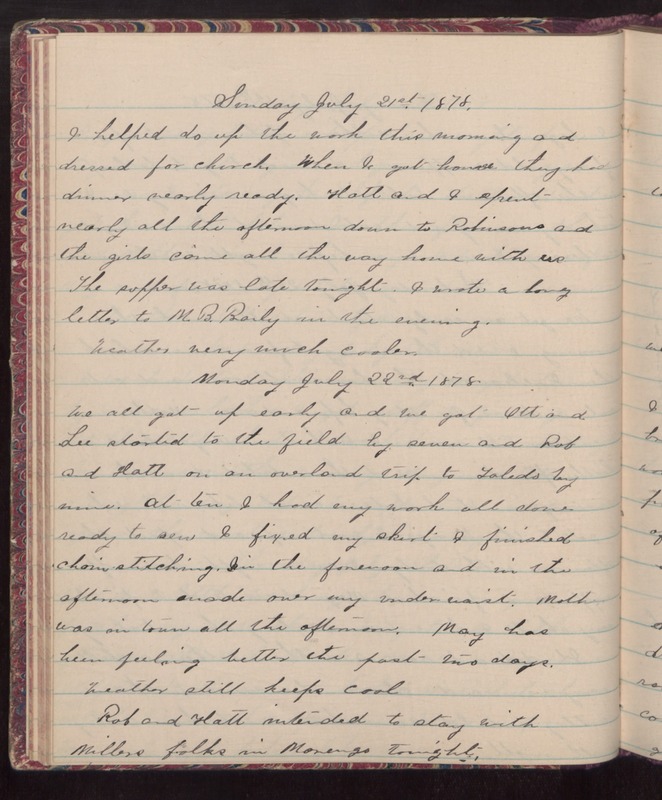 Monday July 22nd 1878 We all got up early and we got Ott and Lee started to the field by seven and Rob and Hatt on an overland trip to Toledo by nine. At ten I had my work all done ready to sew. I fixed my skirt I finished chain-stitching. In the forenoon and in the afternoon made over my under-waist. Mother was in town all the afternoon. May has been feeling better the past two days. Weather still keeps cool. Rob and Hatt intended to stay with Millers folks in Monengo tonight.